Lady K Loves has been a sponsor of my blog for a while, now – in fact, she was my first ever sponsor! – but as it took me a while to get the hang of the whole sponsorship thing I never did a spotlight post. So, as I start the new year and the slightly new attitude toward my blog I’d like you all to, if not welcome, certainly welcome back Lady K Loves! 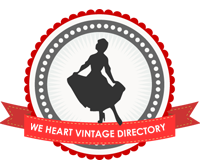 Lady K Loves has a great range of vintage inspired clothing that captures the spirit of the eras I love (the '40s and '50s) but retains a freshness which I think makes their styles accessible for those who aren't comfortable with an entirely vintage look. You can read a little more at the 'About Us' page on the website. 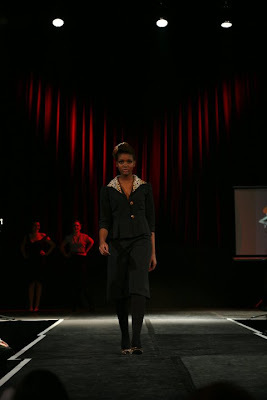 The Swing Dress, pictured here in black, also comes in red, navy and bottle green – I have one of my own, which I received as part of the sponsorship, and it’s not only flattering but very comfortable (it's made from cotton jersey) – I’ve yet to wear it out and about but I’ve tried it on quite a few times since I received it. As you can see the neckline is quite low so I plan to wear mine with a little lacy camisole underneath but it looks lovely as is, if you are a little more daring than myself. As well as dresses, Lady K has some great separates like this Oh Gosh skirt! For my southern hemisphere followers, Lady K even has some lovely swimsuits, which would look just as lovely lounging about if you’re not a fan of swimming. And here’s a little sneak peek at a 1940s inspired suit that hasn’t been released yet! I must say I'm excited for its release as I absolutely love it. What do you all think of it, dear readers? I've been told it will also be available in brown and beige. You can also find Lady K Loves on Twitter and on Facebook. So, take a look at some of her lovely items and follow her on your social networking site of choice! The swing dress is killer! Must check Lady K out. looks great - the swonsuit is the best!